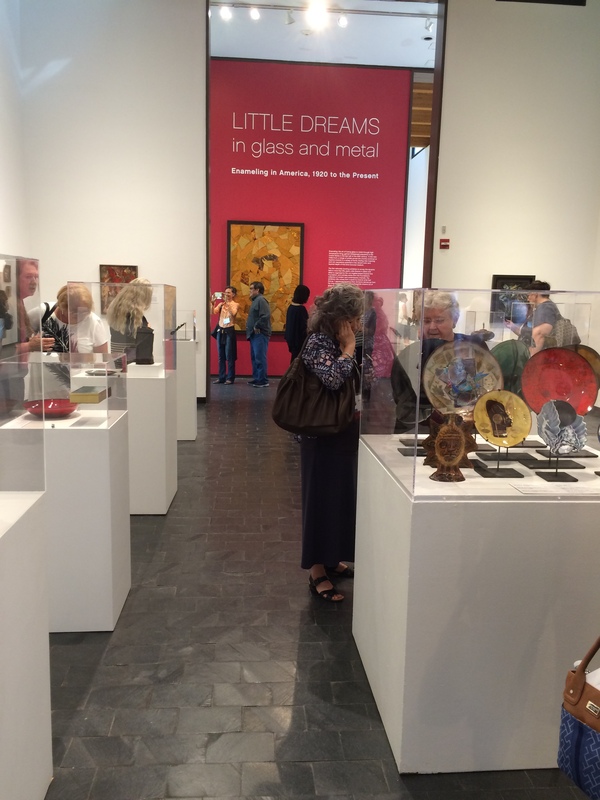 As part of the Enamelist Society’s biennial conference this weekend, attendees viewed the all-enamel show Little Dreams in Glass and Metal: Enameling in America 1920 to the Present, at the Fuller Craft Museum in Brockton, MA. The exhibition includes a wide range of objects from wearable jewelry to large enamel-on-steel wall panels, exploring the history of enameling in this country from 1930 to the present through approximately 120 works from the collection of the Los Angeles-based Enamel Arts Foundation. A beautiful coffee table book/catalog is available for purchase from the museum shop; simply email Denise Karas, Gift Shop Manager, at visitorservices@fullercraft.org. Posted in Enameling. Bookmark the permalink. Hello Jennifer, I would have loved to see this exhibition in-person and would love to read more about it, if possible. While I do not currently use enamel in my work, I’ve been fortunate to study w/ some of the bests. Happy to have discovered your blog! It’s wonderful! Hi Patricia…There is a wonderful book “Little Dreams in Glass and Metal” that is available from the Fuller Craft Museum. There are, of course, big, fabulous photos with interesting and informative content.